You can enhance your Databoard with elements of your organization’s visual identity to make Databoards more attractive and personalized. Use the instructions below to customize your Databoards. Hover over the Databoard you would like to edit and click on the " Edit" icon. In the Databox layout designer, click on the "Visual settings" icon in the top menu bar. add your company or client logo. Pick the predefined background color or select custom color. You’ll need to upload an image, at least 1920px wide but no larger than 10 MB in JPG, PNG or GIF format. The logo will appear in the lower left-hand corner of your databoard. You’ll need a logotype with a transparent background of at least 400px wide. Supported formats are JPG, PNG and GIF. 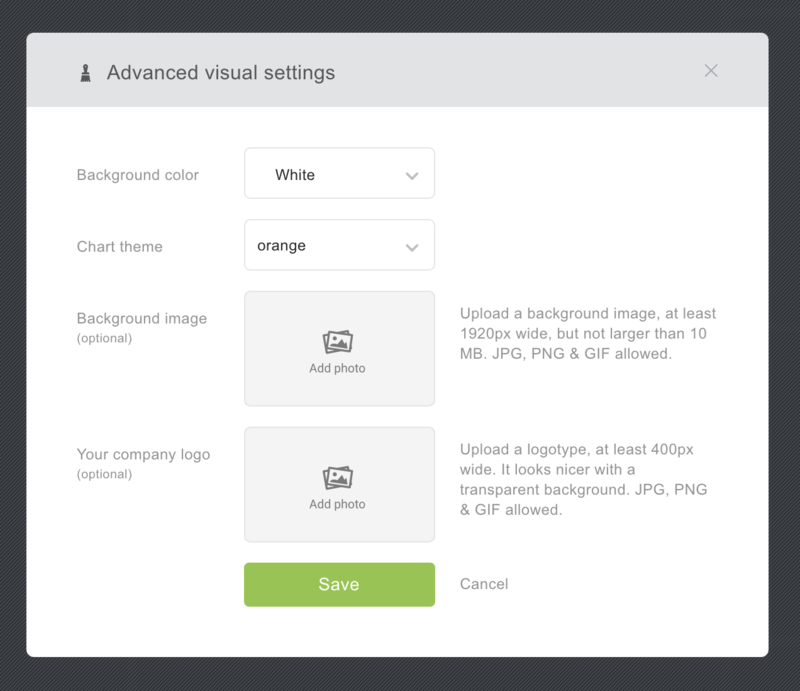 When you’re done uploading your images, don’t forget to "Save" your progress. To preview your Databoard click the "Preview" icon on the top bar (next to the color picker). This will open a new browser window with a unique URL, also accessible to people who are not signed into the Designer. This makes it easy to share your Databoard with your team. Here we strongly recommend adding additional security to your shared Databoards to ensure that only the right people gain access. Read this article from the “Share your Data” section to learn how to limit access to your Databoards.